· STIX/TAXII™ 2.0 Interoperability Test Document: Part 1 Version 1.1. Edited by Allan Thomson and Jason Keirstead. Latest version: https://docs.oasis-open.org/cti/stix-taxii-2-interop-p1/v1.1/stix-taxii-2-interop-p1-v1.1.html. This is Part 2 of the Interoperability test documents which supplement the five-part Structured Threat Information Expression (STIX 2.0) and TAXII 2.0 specifications developed by the Cyber Threat Intelligence Technical Committee (CTI TC) of the Organization for the Advancement of Structured Information Standards (OASIS). This test document provides detailed requirements on how producers of products within the threat intelligence ecosystem may self-certify and demonstrate that their software is interoperable with other systems implementing STIX/TAXII 2.0. There are eight personas detailed in this specification. These are: Data Feed Provider (DFP), Threat Intelligence Platform (TIP), Threat Mitigation System (TMS), Threat Detection System (TDS), Security Incident and Event Management (SIEM), Threat Intelligence Sink (TIS), TAXII Feed (TXF) and TAXII Server (TXS). This Interoperability test document defines tests of the following test cases: common connection, basic data sharing, and basic threat intelligence collaboration. For each of these test cases the document defines what the Producer, TAXII Server and Respondent need to support to satisfy each test case. STIX/TAXII™ 2.0 Interoperability Test Document: Part 2 Version 1.0. Edited by Allan Thomson and Jason Keirstead. 05 November 2018. OASIS Committee Note 01. https://docs.oasis-open.org/cti/stix-taxii-2-interop-p2/v1.0/cn01/stix-taxii-2-interop-p2-v1.0-cn01.html. Latest version: https://docs.oasis-open.org/cti/stix-taxii-2-interop-p2/v1.0/stix-taxii-2-interop-p2-v1.0.html. This document defines additional test cases and personas for STIX/TAXII 2.0 Interoperability Test Cases and is supplementary to Part 1 v1.1. Please refer to Part 1 v1.1 Section 1.1 Terminology. Within Part 2 the following amended definition of Respondent is used. Future revisions of Part 1 Terminology will be updated to reflect this change. Respondent - A software instance that reads STIX 2.0 content and performs some action on that received data and may send data back to the original Producer to support the particular use case and exchange of intelligence between the systems. [RFC7230] Hypertext Transfer Protocol (HTTP/1.1): Message Syntax and Routing, June 2014, http://www.rfc-editor.org/info/rfc7230. [RFC5246] The Transport Layer Security (TLS) Protocol Version 1.2, AUGUST 2008, http://www.rfc-editor.org/info/rfc5246. [RFC7617] The 'Basic' HTTP Authentication Scheme, SEPTEMBER 2015, http://www.rfc-editor.org/info/rfc7617. This document focuses on testing interoperability of software instances that support STIX and TAXII exchange. It leverages Part 1 v1.1 test cases, and augments them by adding a TAXII Server to facilitate the exchange of STIX bundled content detailed in Part 1 v1.1. The following system personas are used throughout this document. ○ Software instance that acts as a producer and/or Respondent of STIX 2.0 content. A SIEM that produces STIX content will typically create incidents and indicators. A SIEM that consumes STIX content will typically consume sightings, indicators. ○ Software instance that publishes STIX content from a read-only TAXII Server where Respondents are only allowed to receive the STIX content from the TXF. ○ Software instance that acts as a TAXII Server enabling the sharing of STIX 2.0 content among producers and respondents. ○ Software instance of any network product that monitors and/or detects such as Intrusion Detection Software (IDS), Endpoint Detection and Response (EDR) software, web proxy, etc. A TDS will typically ingest STIX content and may emit events or reports that indicate the TDS has detected traffic or behaviors matching the STIX content. ○ Software instance that consumes STIX 2.0 content in order to perform translations to domain specific formats consumable by enforcement and/or detection systems that do not natively support STIX 2.0. These consumers may or may not have the capability of reporting sightings. A TIS will typically consume intelligence identified in the STIX content but will not produce any STIX content itself. ○ Software instance that acts on course of actions and other threat mitigations such as a firewall or IPS, Endpoint Detection and Response (EDR) software, etc. For an organization to receive OASIS STIXPreferred certification, the software instances must adhere to persona behavior and prescribed message contents as detailed in the Required Persona/Profile Support section of each test case. For each persona checklist and test requirements please refer to Section 3 Persona Checklist. This Test Document defines a set of mandatory and optional test cases identified by persona. 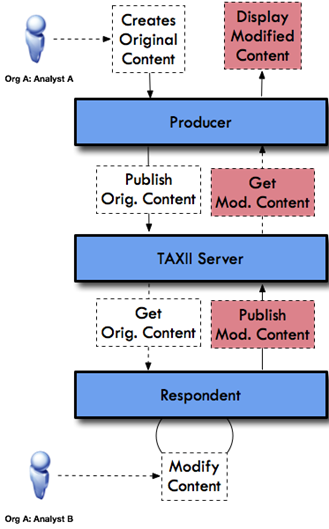 All test cases require the use of a TAXII Server (TXS) used in concert with the Producer and Respondent persona components as shown below. A software product under test may implement multiple personas. Therefore, it is conceivable that a single software product instance may support a TAXII Server persona, the producer and the respondent personas in that instance. However, for the purposes of this test case document, each specific persona verification and expected behavior is called out separately. 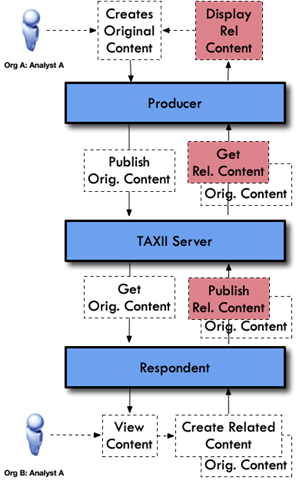 The following figure provides a simplified uni-directioinal workflow of data to highlight the relationship between a Producer, a TAXII Server and a Respondent. This document details the following test cases. The following common test case requirements apply to Part 2 tests. The HTTPS over IPv4 protocol must be used for all test cases in this document. Future versions of this document may introduce testing HTTPS over IPv6 as the TAXII transport protocol. There are no defined tests that exclude IPv6 support if an organization wishes to execute those tests with HTTPS over IPv6. a. STIX 2.0 specification allows object references that are not distributed within the same Bundle. However, for simplicity and test purposes only, this specification chooses to define all test data without the Bundle wrapper so that organizations may test support of the creation or import of the data across a single bundle or multiple bundles. b. Future tests may verify additional cross-Bundle object references. c. Unless otherwise specified by a test description, all objects created and referenced by that test case should be contained within at least one Bundle produced by the persona under test. The test cases in this section apply to all personas that connect to a TAXII Server (TXS) or TAXII Feed (TXF). To ensure baseline interoperability between every Producer, every Respondent and the TAXII Server that connects those persona together, every test in this section must be completed. For further details on all required tests please refer to Section 3: Persona Checklist. Recommendation: Advancing to Basic Feed Sharing and Basic Intelligence Collaboration test cases should not be attempted until the test cases in this section are completed successfully. Title: "Incorrect API Root Get"
Description: "An incorrect URL for an API root was accessed"
The systems under test (producer or respondent) must be able to connect to a TAXII Server (TXS) or TAXII Feed (TXF) and display the appropriate connection status as described in the tests below. The SUT must show that the returned data matches the setup data Test-Data #1: Discovery Service, as defined in Section 2.2.2. The SUT must show that the returned data matches the setup data Test-Data #2: API Root Service, as defined in Section 2.2.2. All responses in this section must reflect what is configured in Section 2.2.2 TXS Configuration. For data responses that are not based on configured parameters, then the data responses shown are intended to be best practice examples only and judgement by the organization developing the solution should be used to follow those best practices. This test will verify that all personas except TXS and TXF can correctly request a Discovery Resource, process the response from the TAXII Server, and display the resource correctly. For TXS and TXF personas, this test will verify that they can correctly process the request and deliver the appropriate response as defined in the table below. This test will verify that all personas except TXS and TXF can correctly request an API-Root Resource, process the response from the TAXII Server, and display the resource correctly. For TXS and TXF personas, this test will verify that they can correctly process the request and deliver the appropriate response as defined in the table below. This test will verify that TXS and TXF personas will correctly respond to requests that are missing the authorization parameter as defined in section 2.1. Further this tests will verify that all personas except TXS and TXF can correctly process and display the error response from the TAXII Server when the request was missing the authentication parameter. WWW-Authenticate: Basic realm="taxii", type=1, title="Login to \"apps\"", Basic realm="simple"
This test will verify that TXS and TXF personas will correctly respond to requests that included an incorrect authorization parameter as defined in section 2.1. Further this tests will verify that all personas except TXS and TXF can correctly process and display the error response from the TAXII Server when the request included an incorrect authentication parameter. This test will verify that TXS and TXF personas will correctly respond to requests that use an incorrect API Root as defined in section 2.1. Further this tests will verify that all personas except TXS and TXF can correctly process and display the error response from the TAXII Server when the request included an incorrect API Root as defined in Test Data #1.3. This test will verify that TXS and TXF personas will correctly respond to requests that use an incorrect Collection ID as defined in section 2.1. Further this tests will verify that all personas except TXS and TXF can correctly process and display the error response from the TAXII Server when the request included an incorrect Collection ID. Basic Feed Sharing provides for a Producer persona component to produce STIX content and share it with other Respondents via a TAXII Server. TAXII is the required mechanism to publish STIX content to a TXS. A TXF is a read-only TAXII server and provides no TAXII write functionality and as such how content gets to the TXF is out of scope. For all tests in this section the TXS or TXF must be configured with the configuration defined in Section 2.2 Common Connection as well as one of the following three configuration setups. Numerous tests in this section refer to collection IDs during their execution. In these tests, the UUID defined in the Test Data sets is used to reference the collection under test. When performing the test, if the following IDs are not used, they MUST be substituted with UUIDs that actually exists in the TXS or TXF that meets the configuration requirements for the test being performed. TXS Setup A: Demonstrate the use of a collection for adding data to the server and a separate collection for reading from the server. TXS Setup B: Demonstrate the use of the same collection for adding and reading data to/from the server. TXF Setup C: Demonstrate the use of a single read-only collection for reading from the server. The producer persona must be able to create all content according to Part1: Indicator Sharing. The following behavior describes the general data flow for each required test case, given below. Step 1: Verify that each Producer and TXS under test can perform all Common Connection Test Cases successfully. Step 2: Verify that each Producer under test can correctly discover the correct collection as defined in Setups A, B and C are that they are returned correctly to the Producer from the TXS under test. Step 3: Verify that each Producer under test is able to generate and publish all test data defined in Part1: Indicator Sharing Producer Test Cases to the TXS under test and verify the TXS receives that data correctly in the Collection as defined in Step 2. For Setup A where the collection is write-only, verification of a successful write primarily relies on producing logs and status messages indicating that the data was successfully written by the Producer. For Setup B where the collection is read-write, verification can additionally be done by using a separate TAXII GET request to retrieve the data previously written. Before each test is performed in this section verify that the Producer allows a user to select or specify the URL Address of the TXS to connect to (example https://10.1.1.10:443/) and performs the tests described in Section 2.2: Common Connection Test successfully. This test will verify that the TXS will correctly respond to requests to a Write-Only Collection ID and the Producer sending the request verifies that it parses the permission flags correctly for publishing data to the collection. This test case does not apply to a TXF persona. a) HTTP Content-Type is "application/taxii+json;version=2.0"
2) Upon successful receipt of the TXS response, the Producer is able to proceed with publication tests defined in P2-BF-2 to P2-BF-11: Indicator Publication test section. This test will verify that the TXS will correctly respond to requests to a Read-Write Collection ID and the Producer sending the request verifies that it parses the permission flags correctly for publishing data to the collection. 2) Upon receipt of the TXS response that the Producer is able to proceed with publication tests. This test will verify that the TXS will correctly respond to requests to a Read-Only Collection ID and the Producer sending the request verifies that it parses the permission flags and reports an appropriate message to an administrator or user that this collection does not allow publication to it. 2) Upon receipt of the TXS response that the Producer reports an error that the collection is not writable and the Producer does not attempt any further write actions with that collection. For each test case listed in this section, the general form of the POST and POST-RESPONSE are as follows. Match the content in the To TXS or From TXS cells in the table below, with the correct total count of objects. For each section described in Part1: Indicator Sharing Producer Test Cases the Producer will publish the content to the TXS at the appropriate collection where the TXS component will not respond to the post until all objects within the bundle have been processed. These tests do not apply to the TXF persona. * The UUID shown in this table is the one defined for the write-only collection. If the test is being performed for a write-read collection, then replace the UUID with an appropriate collection UUID. "List of objects defined in the Part1 bundle test cases"
*The total count of objects includes the identity object and the associated intelligence objects. The Respondent persona must be able to get all content according Part1: Indicator Sharing. The following behavior describes the general data flow for each required test case, given below. Step 1: Verify all Common Connection Test Cases successfully pass for each Respondent under test and TXS or TXF under test. Step 2: Verify for each Respondent under test that the correct readable collection for Setups A; B and C are discoverable and returned to the Respondent from the TXS/TXF under test. Step 3: Verify for each Respondent under test that it is able to read all test data defined Part1: Indicator Sharing Respondent Test Cases to the TXS/TXF under test and verify the TXS/TXF returns that data correctly from the Collection defined in for Setups A; B and C to the Respondent. For each of the test cases listed in this section, the general form of the GET and GET-RESPONSE are as follows. match the content in the To TXS/TXF or From TXS/TXF cells in the table below, with the correct total count of objects. *The total count of objects include the identity object and the associated intelligence objects. Basic Intelligence Collaboration provides for a Producer persona component to produce STIX content, typically initiated by a human analyst, and share that content via a TAXII Server with a Respondent persona component. That Respondent then may respond with further changes to the same or related intelligence content. ○ In this scenario the first analyst creates an intelligence element that they wish to share with other analysts within the same organization for their perspective and feedback. ○ The second analyst receives the intelligence from the first analyst and then proceeds to modify the existing intelligence, using the same organization's identity, and reshares back to the first analyst for their review and acknowledgement. ● Test Case #2: Different organizations sharing and modifying related intelligence between two analysts using two systems. ○ In this scenario the first analyst creates an intelligence element that they wish to share with another set of analysts in a sharing community. The other analysts in this sharing community belong to different organizations. ○ The second analyst receives the intelligence from the first analyst and then proceeds to find some new content that they believe is related to the original intelligence. They proceed to then share the new intelligence back to the sharing community, including the relationship that connects the intelligence together. ○ In this scenario the first analyst creates an intelligence element that they wish to share with another set of analysts in a sharing community within the same organization. Additionally, the organization wants to track each individual analyst’s contributions. ○ The second analyst receives the intelligence from the first analyst and then proceeds to find some new content that they believe is related to the original intelligence. They proceed to share the new related content back to the sharing community, including the relationship that connects the intelligence together. ○ The data flow for Test Case #3 resembles Test Case #2 except that both analysts work for the same organization. For all tests in this section the TXS must be configured using a combination of the Section 2.2: Common Connection tests and the Section 2.3: Basic Feed Sharing: Required TXS Configuration. Refer to Table 2.3.2 for an illustration of combined configurations. For Tests P2-IC-2 to P2-IC-21, both Producer and Respondent must be configured as the same created_by entity (i.e. the same organization entity) to ensure that both systems may modify the same intelligence shared between the Producer and Respondent. For Tests P2-IC-22 to P2-IC-31, both Producer and Respondent must be configured with different created_by entity (i.e. different organization entities) to ensure that each system enforces rules on modification of intelligence consistent with the STIX specification that disallows modification of non-same organizational intelligence. Numerous tests in this section MUST refer to collection IDs during their execution. In these tests several UUIDs are defined to reference the collection under test. When performing the test, this ID MAY be substituted with any UUID that exists in the TXS Server that meets the configuration requirements for the test. The producer persona must be able to create all content according Part1: Indicator Sharing. The following behavior describes the general data flow for each test case. Step 2: Verify that each Producer under test can correctly discover the correct writeable collection as defined in Setups A and B are that they are returned correctly to the Producer from the TXS under test. Step 3: Verify that each Producer under test is able to generate and publish all test data defined in Part1: Indicator Sharing: Required Producer Persona Support to the TXS under test and verify the TXS receives that data correctly in the Collection as defined in Step 2. This test will verify that the TXS will correctly respond to requests to the appropriate Write-Only Collection ID and the Producer sending the request verifies that it parses the permission flags correctly for publishing data to the collection. This test will verify that TXS will correctly respond to requests to the appropriate Read-Write Collection ID and the Producer sending the request verifies that it parses the permission flags correctly for publishing data to the collection. 4) Upon receipt of the TXS response that the Producer is able to proceed with publication tests. The Respondent persona must be able to get all content according Part1:Indicator Sharing: Required Respondent Support section. The following behavior describes the general data flow for each test case. Step 1: Verify that each Respondent and TXS under test can perform all Common Connection Test Cases successfully. Step 2: Verify that each Respondent under test can correctly discover the correct readable & writeable collections as defined in Setups A and B are that they are returned correctly to the Respondent from the TXS under test. a) Match the content in the To TXS or From TXS cells in the table below, with the correct total count of objects. *The total count of objects includes the Identity object and the associated new intelligence objects. The following checklists summarize all tests that a persona (Producer or Respondent) must conform to within that persona for both Part 1 and Part 2. An organization must submit the results for their specific persona(s) to the OASIS CTI TC Interoperability SC to achieve confirmation of interoperability and to be listed on the OASIS website page showing the organization’s compliance to STIX 2.0. Results must be submitted to the STIX Interoperability sub-committee for verification via the STIXPreferred portal at https://oasis-stixpreferred.org/. Part 1 checklists are duplicated for each persona within this document. Test results for both Part 1 and Part 2 must be provided if submitting results for a STIX/TAXII certification that is being submitted for Part2. Results may be submitted as separate logs; documents; screenshots; any other proof such that the reviewers can assess whether the organization has successfully complied with STIX/TAXII 2.0 interoperability tests specified herein. 2) For each test, add a reference in the results column indicating what evidence documentation supports your compliance results. 3) Submit both the filled in section and all indicated supporting documentation. 3) Summary of your compliance demonstration findings that substantiate interoperability conformance. No independent testing will be performed by the Interoperability SC; rather compliance will be based solely on your self-verification testing, confirmed through your complete and accurate test results, accompanied by your indicated supporting documentation. 1) Identify one or more persona(s) that your software is being tested against. Go to the section and for each row in the verification tables (Part 1 and Part 2) perform self-certification tests that prove that your software outputs the expected results and behaves according to the general test case data flows. c) TAXII Server (Part 2 test cases only). 3) For the identified role (e.g. Producer), perform the test in that row/role combination, capture evidence of your software’s behavior, and paste that evidence into the table’s Results column, confirming that the expected behavior is met. If your software has both roles for a test row, then record the results for each role separately. a) Example 1: Organization A wants to self-certify their Data Feed software product. They identify that they are producing threat intelligence and test their software as a Producer in both Part 1 and Part 2 test case tests. b) Example 2: Organization B wants to self-certify their Threat Intelligence Platform. They identify that their software is both a Producer and Respondent in the tests cases for Data Feed sharing and Basic Intelligence Collaboration. For each test, Organization B will perform and record the test results for each role. i) Test result #1, you record results as a Producer of the intelligence and Test result #2, you record results as a Respondent to the intelligence. For each test, you may choose to use your software as both Producer and Respondent in the test scenario or as a 3rd party that acts in those roles. 4) For test rows that identify numbered Test Cases (UC), perform that test for each UC# and provide results for each Test+UC server combination. For the purpose of this document a DFP may be defined as a software instance that acts as a producer of STIX 2.0 content. Any instance being qualified as a DFP must confirm test results for the following tests for both STIX/TAXII 2.0 Interoperability Test Documents Part 1 and Part 2. For the purpose of this document a TIP is defined as a software instance that acts as a producer and/or Respondent of STIX 2.0 content primarily used to aggregate, refine, and share intelligence with other machines or security personnel operating other security infrastructure. Any software instance being qualified as a TIP must confirm test results for the following tests. For the purpose of this document a SIEM is defined as a software instance that acts as a producer and/or Respondent of STIX 2.0 content. The primary Respondent role of a SIEM is to report indicators and high-level information. The primary producer role of a SIEM is with respect to incidents, observations, and sightings. Any software instance being qualified as a SIEM must confirm test results for the following tests. For the purpose of this document, a TMS is a software instance that mitigates threats in a network. For some of the test test cases, it may act as both a Producer and Respondent. The Respondent TMS primarily consumes and acts on Indicators. The Producer TMS primarily reports sightings. Any software instance being qualified as a TMS must confirm test results for the following test cases. For the purpose of this document a TDS detects threats in a network and may or may not mitigate them. It may act as both a Producer and Respondent depending on the type of test case. The Respondent is primarily concerned with indicators. The Producer role is primarily concerned with sightings. For the purpose of this document, a TXF provides the ability for different systems to receive STIX 2.0 content from the TXF system. How the content is made available to the TXF is out of scope. Any software instance being qualified as a TXF must confirm test results for the following test cases. For the purpose of this document, a TXS provides the ability for different systems to share STIX 2.0 content. The TXS does not produce any STIX content. Any software instance being qualified as a TXS must confirm test results for the following test cases. The following individuals were members of the OASIS CTI Technical Committee during the creation of this specification. Final Draft for TC Ballot. For all tests performed in this section, IP addresses may be substituted as required by the tester’s environment. However, please ensure logs and other testing artifacts can prove support of the interoperability verification.